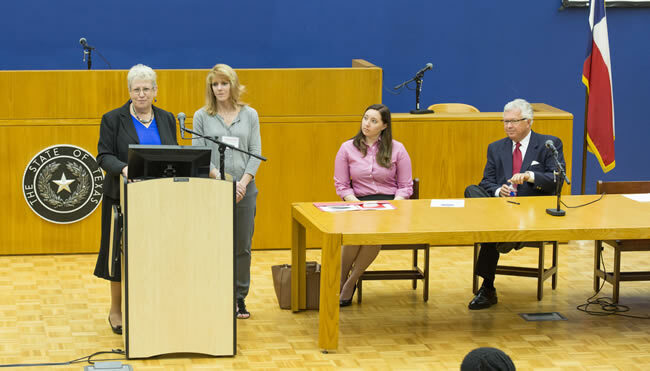 Professor Ellen Marrus, left, Christina Phillis, Lisa Queen and Judge Peter Cahill welcome attendees to the 16th annual Zealous Advocacy Conference in Krost Hall at the University of Houston Law Center. May 4, 2017 - Juvenile justice attorneys learned new legal techniques to defend their clients during the recent 16th annual Zealous Advocacy Conference at the University of Houston Law Center. This year's conference, titled "Gault@50: Quality Representation for Youth," was a two-day event that highlighted the 50th anniversary of the landmark Supreme Court Case that granted children the right to counsel in delinquency cases. The conference focused on access to counsel and quality of counsel in delinquency proceedings. "Gault is a landmark decision as it granted children due process rights, particularly the right to counsel, in delinquency proceedings. As with any Supreme Court decision, however, the implementation is just as important and is why we wanted to focus on access and quality of counsel," said Professor Ellen Marrus, director of the Center for Children, Law & Policy and Royce Till Professor of Law at the Law Center. "Having an attorney guide a child through the delinquency process is more than just having a warm body sitting next to the youth. It is important for the attorney to understand delinquency, civil, criminal, education, immigration and disability law as several examples, adolescent development, family interactions, and how to give a voice to the child's expressed interests. Juvenile law is one of the most complicated and demanding areas of practice." The conference opened with a presentation from Hon. Peter Cahill, a juvenile presiding judge in Gila County, Arizona, (where Gault's case was first heard) and Lisa Queen, an attorney in Maricopa County, Arizona. Cahill and Queen recounted the story of Gerald Gault and how his arrest eventually led to the monumental Supreme Court decision of In re Gault. "This journey did change America, and it transformed our constitutional law," Cahill said. "However, the concept of a child having a right to justice had been argued decades before in the state supreme courts of New Hampshire, Utah, Nebraska and New Jersey." Cahill was also part of the next panel that featured Judge Darlene Byrne, a 1987 Law Center alumna, and judge of the 126th Judicial District Court in Travis County and Nadia Seeratan of the National Juvenile Defender Center. This panel discussion focused more on the quality of counsel and representation beyond the guilt or innocence phase. Byrne encouraged the use of review hearings in juvenile court as an alternative to sentencing children to probation. "The point of the review hearings is trying to see if we can re-assess the length of a juvenile's probation," she said. "If they're knocking it out of the park, we want to see if we can get them off our radar. The sooner I can get them off probation and keep the community the safe, it's all the better." The following speaker was Amanda Powell with the National Juvenile Defender Center, who discussed civil rights and juvenile justice. Powell's presentation displayed how minority youth are routinely singled out in the criminal justice system, and that it is imperative for advocates to raise the issue of race. "We can't just stand here and do nothing," Powell said. "We're in the 50th anniversary of Gault and the 50th anniversary of the civil rights movement, and we have not gotten very far. It is our responsibility to raise race at every opportunity. It's work, effort and years of practice but it's freedom. " The high school students from Marrus' street law class participated in the championship round of a mock trial competition that Byrne presided over during lunch. Law students taught the law to high school students and coached them for the Mock Trial competition that was based on the case of Gerald Gault. Byrne gave feedback to the high school attorneys which was helpful to the practicing attorneys in the audience. Afterward, Houston Texans running back Akeem Hunt spoke about the significance of education, and how it helped him on his trajectory from student-athlete at Purdue University to making a roster in the NFL. Currey Cook, director of the Youth in Out-of-Home Care Project at Lambda Legal, and Dustin Rynders '06, a staff attorney at Disability Rights Texas, led a discussion on the representation of LGBTQ youth. Cook said that many attorneys are unaware that their client is LGBTQ, and that the juvenile justice system has long had an issue with the acceptance of juvenile defendants who identify as LGBTQ because of misconceptions about sexual orientation and gender identity. "Talk to youth without parents present in a setting that provides the greatest amount of privacy possible, and clearly explain and maintain attorney-client confidentiality," he said. "Attorneys must also ensure that others treat al LGBTQ youth with fairness, dignity and respect." The first day of the conference ended with an ethics discussion led by Marrus and Christina Phillis, director of the Office of Public Defense Services in Maricopa County, Arizona. The conference's second day began with a panel on victims of human trafficking, which included Judge Angela Ellis of the 315th District Court in Harris County, Elise Griesmeyer, the crime victims supervisor at the Catholic Charities Cabrini Center, Neena Satija, a reporter with the Texas Tribune and Sherri Zack, an assistant U.S. attorney with the U.S. Department of Justice. "Some youth do not always identify themselves as human trafficking victims, and don't want to be rescued," Ellis said. "Victims are often mislabeled as criminals, rather than victims and have a distrust of law enforcement and treatment providers because of it." "When Native-American youth come into contact with the juvenile justice system, they may be prosecuted in three distinct justice systems: federal, state and tribal court," he said. "Your client may also be facing separate or different allegations in another jurisdiction." Powell and Seeratan led the next discussion on juvenile appellate review. They staunchly advocated for the use of appeals and explained how appeals serve the essential functions of correcting legal errors. "Appeals push secretive juvenile court proceedings into the light," Powell said. "Collaborating with colleagues on appeals builds lasting and powerful relationships that enhance your practice. Creating a culture of vigorous appellate practice ensures justice and fairness for everyone." The final panel featured a question-and-answer session about the legal representation of immigrant youth. Panelists included Dalia Castillo-Granados, director at the Children's Immigration Law Academy, Liz Shields, a supervising attorney for pro bono programs at Kids in Need of Defense in Houston and Lauren Fisher Flores, a supervising attorney at the Young Center for Immigrant Children's Rights. This day also ended with a discussion of ethical considerations that arise when representing juveniles. Marrus' students Juvenile Law students produced a video that showcased common ethical violations, including taking direction from the parents rather than the youth client, not following client's expressed interests, and being unprepared for hearings.